The Kane County Cougars, in conjunction with the organization's Major League affiliate Arizona Diamondbacks, have announced the field staff for the 2015 season and 25th anniversary season of the Cougars franchise. Mark Grudzielanek has been named the 16th manager in franchise history. Grudzielanek, 44, enjoyed a 15-year playing career in the Major Leagues that included an All-Star selection in 1996 and a Gold Glove Award a decade later as a second baseman in 2006. In 1,802 big league games, Grudzielanek batted .289 with 90 home runs, 640 RBIs and 2,040 hits. His 54 doubles in 1997 were a Major League best that season. Grudzielanek was an 11th-round selection by the Montreal Expos in the 1991 Draft and he played with the Expos (1995-1998), Los Angeles Dodgers (1998-2002), Chicago Cubs (2003-2004), St. Louis Cardinals (2005), Kansas City Royals (2006-2008) and the Cleveland Indians (2010). As a Minor Leaguer, Grudzielanek spent the 1992 season in the Midwest League for the now-defunct Rockford Expos. 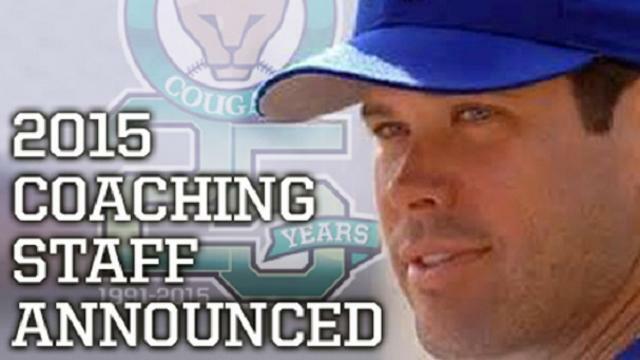 Doug Bochtler will serve as Cougars pitching coach in 2015. This will be Bochtler's fifth season with the Diamondbacks organization. Bochtler was pitching coach at Class A South Bend last season with the team's pitching ERA of 3.49 ranking fourth in the Midwest League. Bochtler pitched in the Major Leagues from 1995-2000, going 9-18 with a 4.57 ERA and 215 strikeouts in 220 games. Vince Harrison has been named Cougars hitting coach. This will be Harrison's second season as a coach with the Diamondbacks after beginning his coaching career with Rookie-level Missoula last season. Harrison spent a portion of five Minor League seasons with the Tampa Bay Rays, New York Mets and Miami Marlins organizations. The Cougars' field staff also includes athletic trainer Rafael Freitas and strength and conditioning coach Sean Light. Freitas remains in the Midwest League after serving as South Bend's athletic trainer last season, while Light spent 2014 with Class A Short Season Hillsboro. Scott Anderson rounds out the field staff, with the 2015 season being his sixth year with the Cougars as clubhouse manager. Last season, the D-backs Minor league affiliates went a combined 473-365 (.564), with the second-best winning percentage behind Texas (.565). The affiliates tied a club mark with five teams in the postseason. Opening Night at Fifth Third Bank Ballpark is set for Thursday, April 9 when the Cougars host Cedar Rapids at 6:30 p.m. Season tickets, ticket packages and catered event group outings are on sale for the 2015 season. Fans can inquire about these options by calling the Cougars at (630) 232-8811 or visiting kccougars.com. The Cougars are looking to defend the Midwest League championship after winning the league title during a historic 2014 campaign that broke numerous franchise records. Last fall, the Cougars were recognized by Minor League Baseball as the "Best Team" in the Minor League Baseball ("MiLBY") awards.